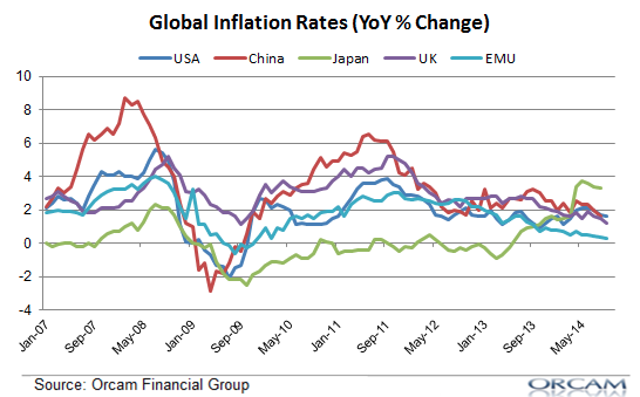 Global disinflation has picked up pace in recent months and several regions of the global economy are now on the verge of a full blown deflation. The latest readings on inflation are just about unanimous - there's widespread disinflation, or a slowing rate of positive inflation. The latest reading out of the USA showed a stagnant, but well below historical average rate of 1.7%. China's rate of inflation has slowed from 2% to 1.6%. The UK slowed sharply to 1.2% from 1.5%. And the EMU is on the verge of deflation at 0.3%. The one outlier of the major economic regions is Japan where the rate of inflation spiked following the currency devaluation due to Abenomics.